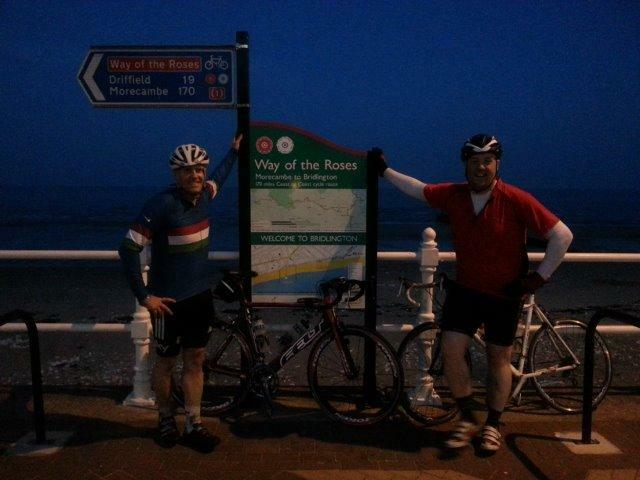 In 2012, my Friend Alex Price and me planned to ride the Way of the Roses route in one day. Unfortunately due to his health we had to abandon our plans in 2012 to try again in 2013. We started training in January 2013 in the cold, wet weather, we planned on doing the ride on 6th July 2013. It has been 10 years since me and my wife both lost our dear mothers to cancer, they both died within 3 months of each other in 2003, we decided to dedicate the ride to these amazing women who sacrificed great deal throughout their lives for their family; at the same time raise money for the Rochdale Springhill Hospice, where they both passed away. Unfortunately in April, Alex’s wife was poorly and he couldn’t carry on training so it looked like I was to do the ride alone! Even more tragedy hit in May 2013 when my dear friend Alex lost his wife, she died suddenly in hospital. He was, and still is, devastated and riding across the country on a bike was the furthest thing from his mind. I carried on the training as we had already raised money and the challenge had to be done! I spoke with Alex and he agreed to meet me in York and cycle stints of 10 – 15 miles with breaks and then meet me at various points along the way until the finish from York. 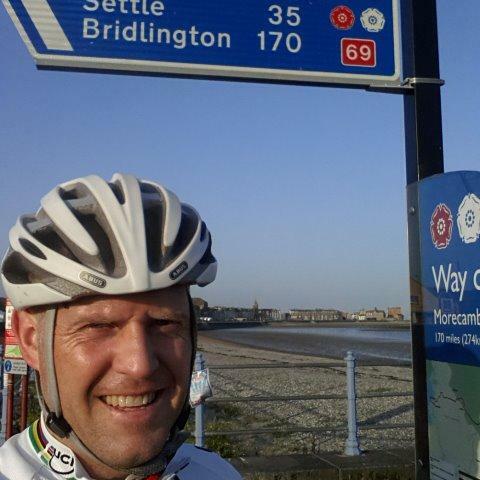 As it turned out, without training my friend managed to cycle the last 61 miles from York to Bridlington! I set off at 6.30am on Saturday 6th July, it was a beautiful sunny morning and tipped to be the hottest day of 2013 to date. I was ready with light supplies and water and of course plenty of sun cream! No wind and a beautiful summer morning as I set off on the journey through the beautiful countryside. I reached Pateley Bridge by 10.30am, 3 hours 56 minutes into the ride. 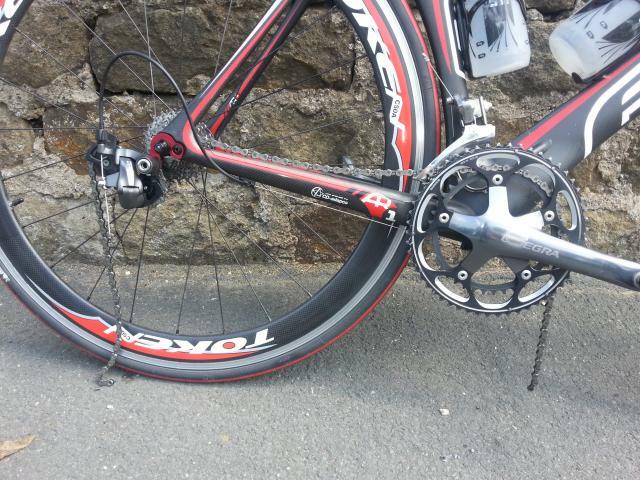 On the descent into Pateley Bridge I noticed that my chain was jumping through the rear derailleur, upon inspection I found that a link was very tight and this was causing the jumping, I managed to free it up but on the climb out of Pateley Bridge…………….SNAP! I was at the road side with a snapped chain! I only had innertubes and general bike tool to hand, my wife and children were doing the route in the car as my support, we had planned to meet at Ripon, York and then Driffield. She was at Ripon waiting for me to arrive when I rang her with the news, so she then had to drive over and try and find me. Meanwhile I managed to temporarily fix the chain and limp down to Stif Cycles in Summerbridge, who handled the situation with the greatest of expertise. They fitted a new chain and serviced the gears so I was able to continue on the challenge……a big big thanks to Stif Cycles! I set off again from Summerbridge to find the route after losing 3.5 hours with the chain problem. I met up with my wife and children in Ripon for a short lunch break and then headed off to York where I met with Alex at about 4.30pm to ride the last 61 miles to Bridlington. With one last stop off at Driffield for a quick sandwich and refuel, we then set of at 8.25pm to complete the last 19 miles to Bridlington. We arrived in Bridlington just after 9.45pm, it was beginning to get dusky and the place was beginning to awaken for the night life, the strange thing about riding to Bridlington was that we couldn’t see the coast until we were literally on the promenade, we thought for a while we had taken a wrong turn or missed a turn somewhere. I can’t tell you of the relief and joy we felt when we finally arrived, we kissed the sign and began to take the photos to document the day! Total ride time was 11:17:24 total elapsed time with food stops and bike repairs was 15:51:09, total elation was through the roof, what a day, what a challenge! Thank you Way of the Roses! I am planning a return journey in September 2013 over 2 days with a local fitness group, lets hope it’s a bit smoother this time!